Neck rejuvenation is becoming one of our most popular treatments. The most effective way to reshape and contour the neck is by performing a surgical procedure called a neck-lift. However, thanks to new advances in technology and science we are able to offer a number of non-surgical treatment options. 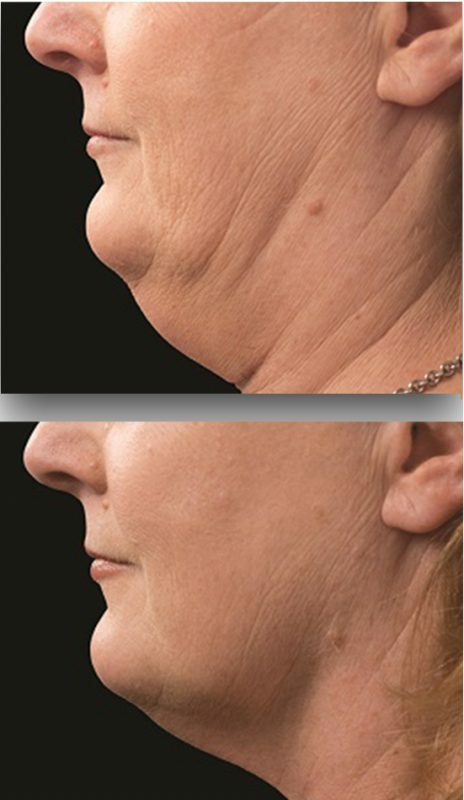 For patients that are concerned with their double chin or fullness in the upper neck, the most common cause for this is excess submental fat. This localised fat can be targeted through our CoolSculpting® (cryolipolysis) Fat reduction treatment option – we use a special applicator on the area which freezes the fat cells this enables them to undergo a natural cell death. The fat is then slowly eliminated over the next 6-12 weeks. Results can be seen after just 1 treatment, however if additional treatments are required, for best results you are able to have the second treatment after just 3 weeks. For patients whose concern lie within the texture and/or elasticity of the skin we find that the stimulation and regeneration of collagen can help to maintain a more youthful look. This method allows your body to regenerate cells within the targeted tissue which encourages the stimulation of collagen. We take your own blood and carefully extract the plasma which is then placed directly in to the tissue. We would recommend a course of x3 sessions, 1 month apart for optimal results. The procedure uses a safe infrared light, to heat the water content in the tissue, deep below the skin’s surface. The heat stimulates fibroblasts which repair cells in your skin to produce collagen, offering long term results. Usually a minimum of 6 sessions are required for good results. Clearlift works by creating thousands of microscopic perforations into the skin on the neck, this encourages a healing response that allows the body to regenerate in this area, a session of x6 would be required for best results. For neck rejuvenation treatment, we would place a number of small fine threads directly under the skin to lift the tissue. The threads last for up to 6 months, during this time your body creates collagen around the threads as a part of the natural healing process. Once this has been achieved, the threads then naturally reabsorb into the body.